OKLAHOMA CITY — In 1920, a distinctive tipi painted with horizontal stripes appeared in a silent film called Daughter of Dawn. 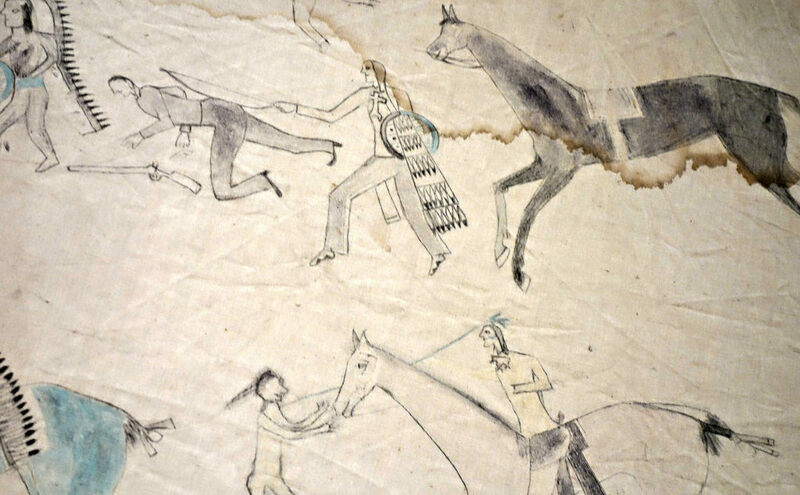 Notable for its 300-member cast of Kiowa and Comanches who brought their own props and costumes, and even staged a real buffalo hunt, the movie was made at a time when the emerging cowboy-Western was already depicting tribe members as stereotypes. These traditional cultural activities were also illegal, but the US government allowed them to revive temporarily as part of the 80-minute film. After its scarce screenings, Daughter of Dawn was basically forgotten, as was the tipi. Now nearly a century later both are rediscovered, conserved, and on view to the public. 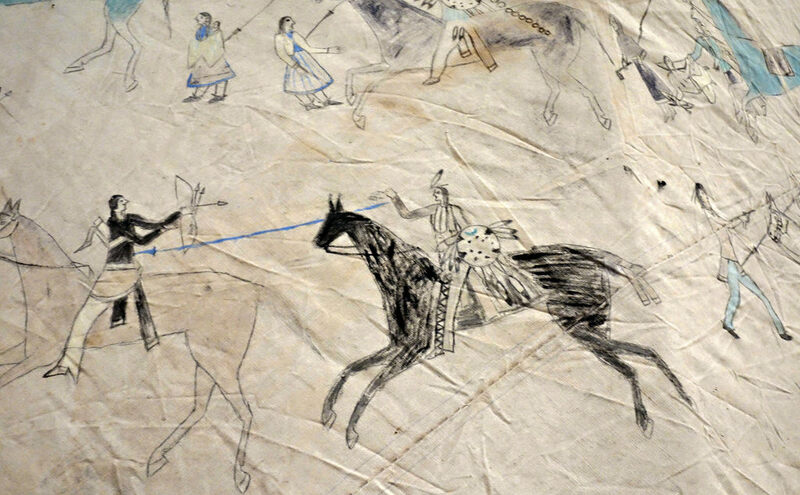 Jṑqī́gácút: Tipi With Battle Pictures went on display at the Oklahoma History Center (OHC) last month, following Daughter of Dawn’s restoration in 2012 and public premiere in 2013 by the Oklahoma Historical Society (OHS), after the movie had been acquired through a private investigator who had turned up the silver nitrate film. 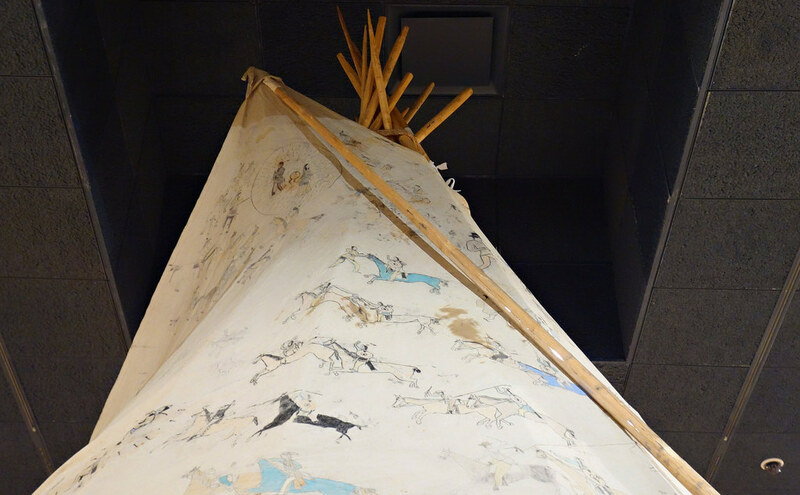 Through film stills, Matt Reed, OHS curator of American Indian & Military Collections, identified a rolled-up canvas tipi he happened upon in OHS storage. 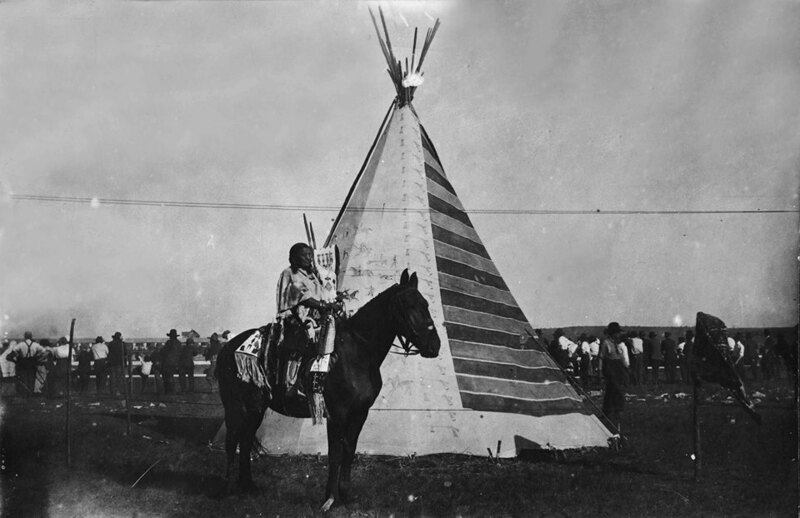 As he described in a 2010 article, no one had looked at the tipi in decades. It turned out to physically date to 1916, but historically was deeper, going back to 1833. 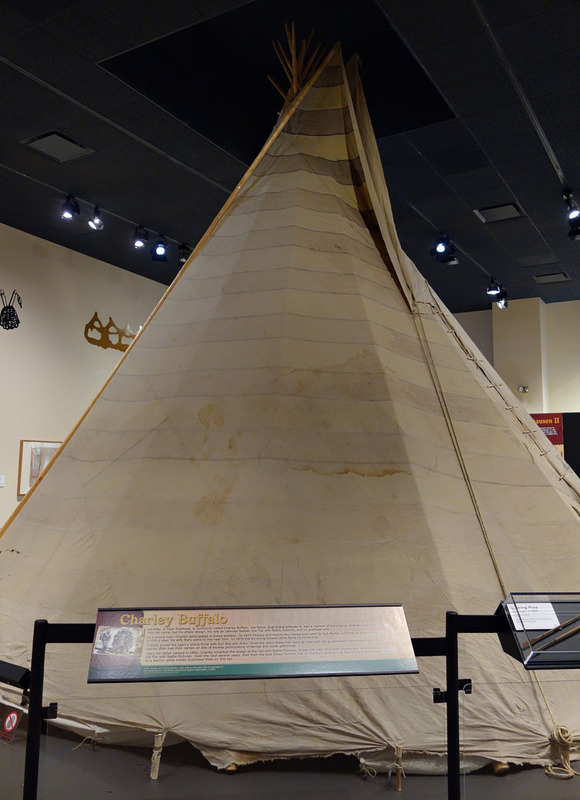 In that year a man named Tohausen became the Kiowa leader, and the tipi carries the tradition of his design. 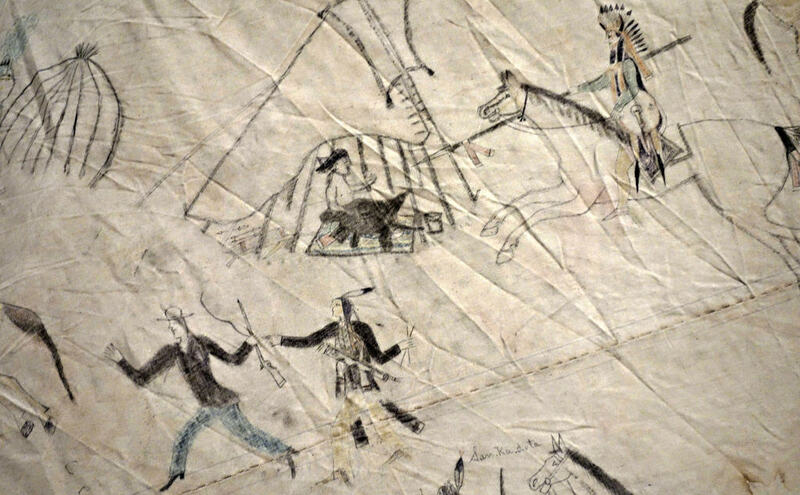 Contextualizing this history means the Tipi With Battle Pictures isn’t just about the tipi, which is stunning. 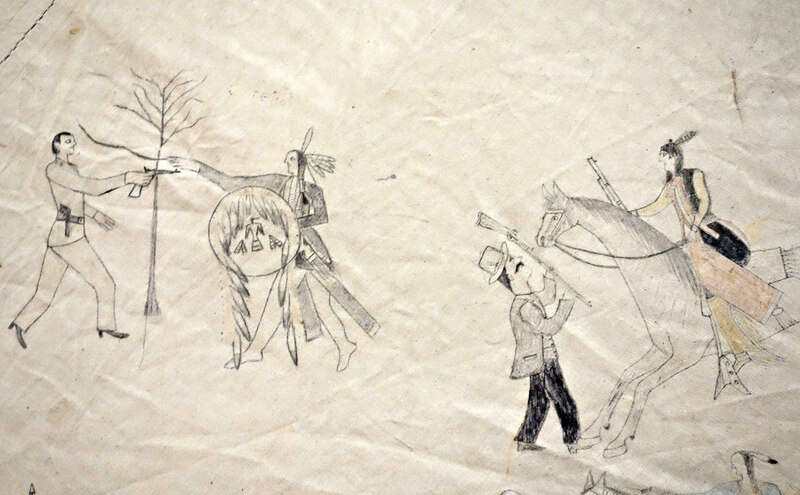 Standing tall in the center of the gallery, it’s illustrated with a swirl of sketched Kiowa warriors, some drawn by prolific ledger artist Silver Horn and others by a 16-year-old Stephen Mopope, a member of the Kiowa Five who were majorly influential in bringing indigenous art into the contemporary scene. 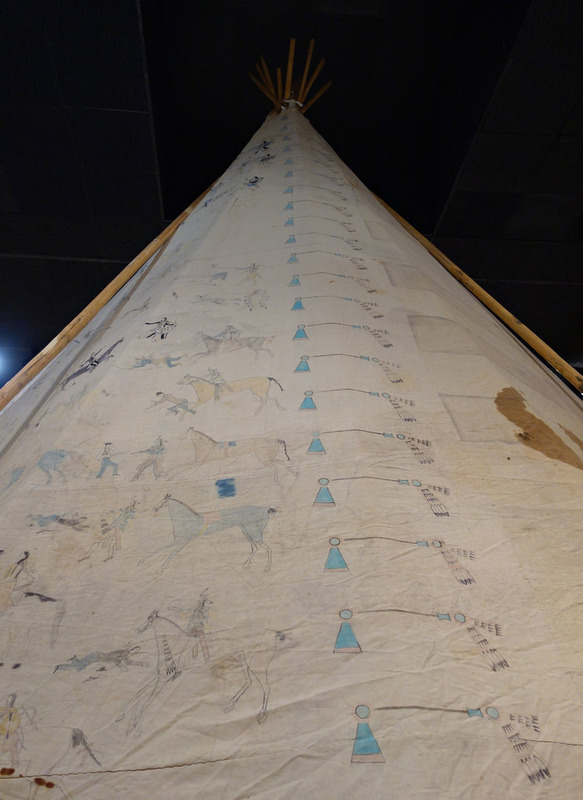 The exhibition narrative starts with the Kiowa origin stories, and continues to how this object’s history connects to the tribe’s relocation to reservations, the film, and other Kiowa art traditions on ledgers and calendars. 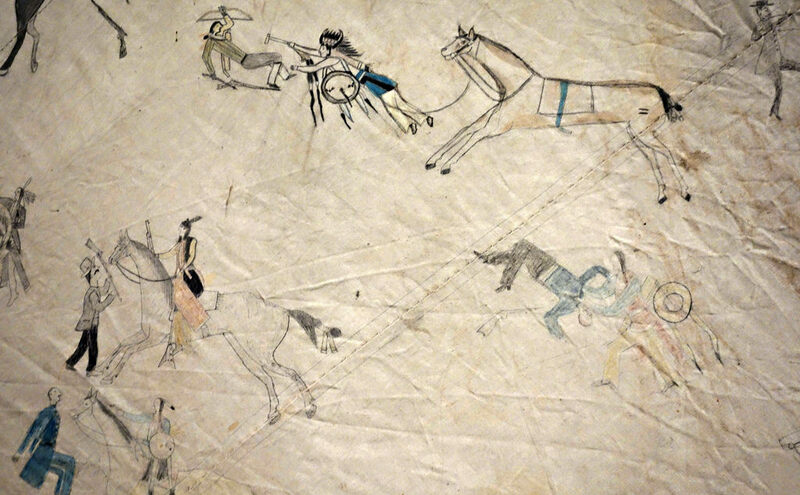 There’s also a cross-tribal connection with some of the tipi designs: the distinctive stripes were given by Cheyenne chief Nah-ko-se-vast in 1845. Now with the tipi on longterm view, with scenes from Daughter of Dawn playing alongside, decades of Kiowa and American cultural history that were considered lost are resurrected. 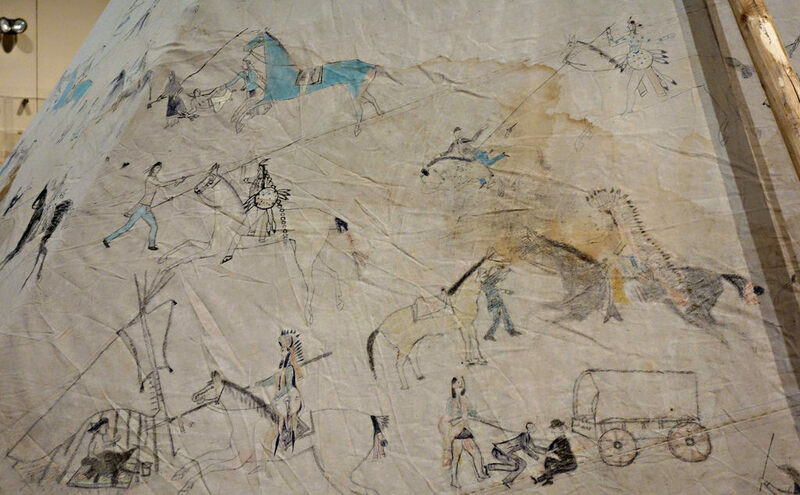 Jṑqī́gácút: Tipi With Battle Pictures is on view at the Oklahoma History Center (800 Nazih Zuhdi Drive, Oklahoma City, Oklahoma).